For those unfamiliar with jumping capital ships, the jump takes a large amount of capacitor. Docking instantly refills. This speeds up the travel time by a tremendous rate. The capital docks and undocks and can immediately jump again instead of waiting for capacitor to regenerate enough capacitor to jump again or starting up capacitor exchange chains to top everyone up. Once I very, very slowly slid out of warp I turned around to head back to the station to rubberneck at the fleet. I love huge, coordinated moves like this one. Hundreds of people coordinated together to move a lot of stuff from one place to another. Over the course of an hour they moved six hundred or so ships. 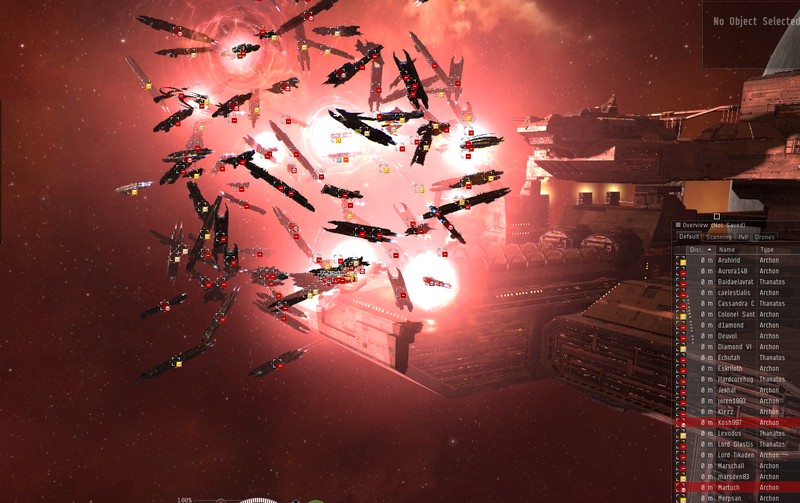 The groups were of jump freighters, carriers, and dreads. Each ship has a different jump range and the individual fleets made a lot of sense. 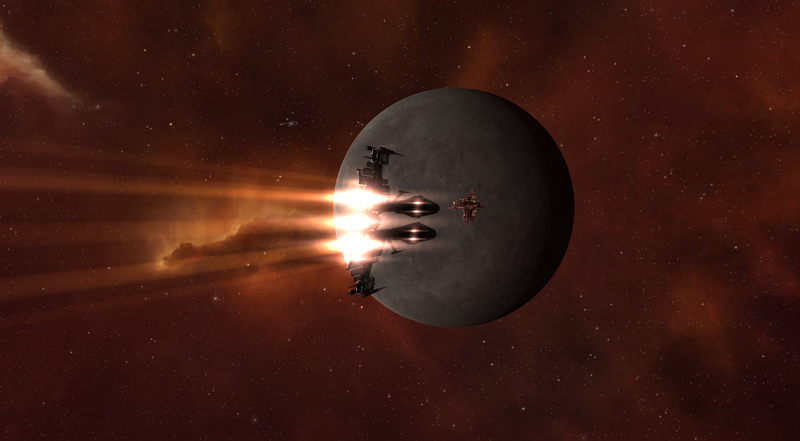 While a normal task for a null sec organization the existence of it is one of the reasons I find Eve to be such an amazing game. As I turned, I could still see the station although I was far enough off grid that I could no longer see the ships. This is not a complaint about grid size. It is about the station size. As I slid back into space a safe difference away and arced above the fleet as they undocked it looked like this. It is not that ships are undocking and overlapping. There is but a limit to space and art. 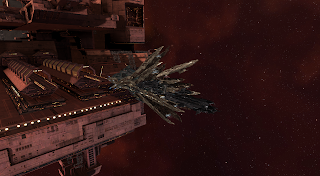 It is how the hell do all of those carriers fit inside of the station. I'm more than happy to accept a bit of reality twisting. Yet, I wonder, should stations simply become bigger? I do not think that they have yet had the V3 treatment. When they redesigned stargates they came out a bit larger and that is what brings the other half of my question forward. 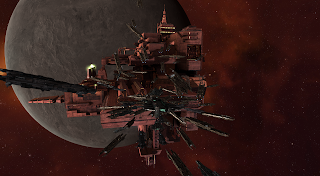 If stations were larger how would that effect PvP around them? I am not a fan of station games at all. I am often puzzled at groups that undock and sit on top of their station waiting for people to come see what is going on. I understand the tactic that is station games even if I do not understand the appeal of it on a personal level. Bigger stations would make the problem worse in a way. The undocks don't have to change of course but the time it make it from one point to another would increase. 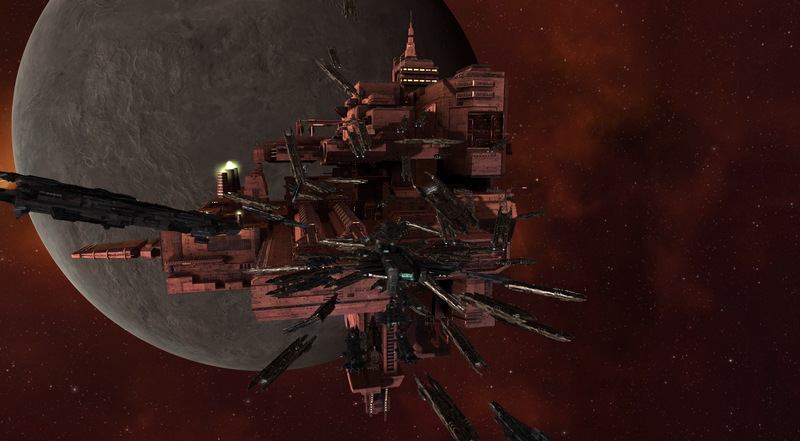 Should the undock ports be increase to the size that a carrier can almost feasible squeeze out? Beyond the odd, mutant look, the size of the ship vs the side of the thing that spits out the ship violates laws of physics. Maybe Eve has its own physics. 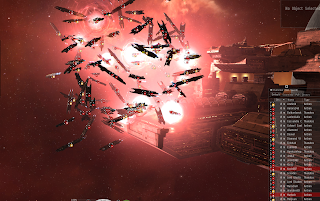 Of course there are "better things" that CCP can do with its time. That always pops up. However, I'm sure the Art time is working on stations already. The new skins will perhaps come with the winter. They have transformer Marauders to create and test at the moment. It is an idle idea. One tossed out into the wind. It is not a game changing idea. But sometimes, small things can be amazing. Oh yes. Carrier and freighter size and the fact that the Cynabal is the size of a battlecruiser. You should have been around a few years ago when stations were like 1/5th as big as they are now. Now they can make them more bigger!